11-inch MacBook Air Sleeve from packandsmooch on Etsy. Leather MacBook sleeve from GalenLeather on Etsy. Basic MacBook sleeve handmade in wool from LaptopTailors on Etsy. MacBook sleeve with flap and front pocket from LaptopTailors on Etsy. Green leather portfolio for MacBook from GalenLeather on Etsy. 13-inch MacBook rustic leather sleeve from iProLeather on Etsy. Fabric MacBook sleeve from LinenMarket on Etsy. Green Herringbone MacBook sleeve from InstanbulDesings on Etsy. Leather MacBook case from ZzzSun on Etsy. Grey Wool Unisex Laptop sleeve from symbiosisbyjulia on Etsy. Blue MacBook sleeve from Boko on Etsy. Handmade Grey and Brown Leather Macbook Case from PicasoLab on Etsy. Brown leather MacBook case from SANTIbagsandcases on Etsy. Top waxed green leather MacBook case from Gizmogadgets Studio on Etsy. Italian leather and wool MacBook case from Cocones on Etsy. In certain social circles and occupations, pulling out a MacBook comes with a certain amount of respect. In others, pulling out a Lenovo will win you more professional kudos. Regardless of what laptop you are using though, sometimes what you dress your technology in is more important for impressing people than the brand name. 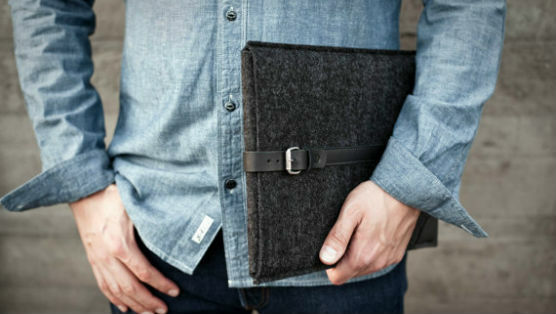 From Italian leather to stylish felt, these handmade MacBook sleeves from Etsy are sure to catch an eye. Many of these work for a variety of different MacBook models, as well as similarly-sized Windows laptops.